LONDON, England (CNN) -- A number of filmmakers have looked to golf for inspiration for their movies -- but it is not often a professional golfer does the reverse. Three-time major winner Padraig Harrington has broken the mould after experimenting with a devastating ice-hockey swing as used in the cult U.S. comedy sports film Happy Gilmore. The film's plot centers of the fortunes of failed ice-hockey player Happy Gilmore, played by Adam Sandler, who masters a powerful and dangerous slap shot which he converts to golf with devastating effect. The result is that Gilmore is able to whack a golf ball over 400 yards, and now Irishman Harrington has copied Gilmore's breathtaking run-and-smash technique - and amazingly has added an extra 30 yards to his drive! But is the spectacular swing legal? The Royal and Ancient (R&A), who along with the United States Golf Association (USGA), produce and revise the rules of golf, can see no problems with the method. A spokesperson at the rules department of the R&A told CNN: "There is nothing in the rules as such to prevent the swing as performed in the film Happy Gilmore from being used by golfers. You do not have to be standing still over the ball when playing a shot, so striking the ball with a run-up is okay. "The major concern we do have is regarding the whether it fits in with the etiquette of the game as defined in the rules. Players must have respect for the course itself and perhaps this shot lends itself to increased likelihood of damage to the course." 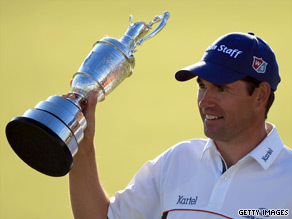 While Harrington may not necessarily be ready to unleash the eye-catching swing when he goes in search of his third consecutive British Open Championship title at Turnberry, Scotland next month, the technique may still have a place in the game. Dr Mark Smith, who is part of the Golf Education and Research Group at the University of Lincoln, England, believes that, with development, the swing could become part of the range of shots used by the modern golfer. "Golfers are always looking for ways to improve their game which might give them an edge on their rivals so it wouldn't surprise me if some professionals start to experiment with the swing used by Happy Gilmore," Smith told CNN. "One of the obvious benefits of the swing is that it allows you to generate more power and subsequently more distance on the shot as Padraig Harrington has shown. "Certainly the scientific principles behind the swing and the technology used are credible as well, although golf is just as much about accuracy as power." Dr Smith does have some reservations about the possible risk of injury with the swing -- particularly if it is not executed properly. "The main drawback of the 'Happy Gilmore technique' from a physiological point of view is that it does place much more stress on the spine, lower back and the shoulders," he added. "Therefore the likelihood of injury is increased so certainly I would be cautious of amateur players rushing down to their local club and trying to copy him thinking it might drastically improve their game. "Perhaps a player might use when he feels has nothing to lose in a match, but when it comes to pressure situations players tend to fall back on tried and trusted methods." Certainly Harrington's use of the 'Happy Gilmore technique' has got golf talking, but perhaps a copy of the film will not be found on the shelves next to coaching manuals just yet.